I was catching the train the other night and noticed the advertising billboard below. It was informing everyone that Google Maps now has the ability to include public transport routes as a part of it’s service. The poster intrigued me, because it’s one of those artifacts that has come primarily from the digital world but is represented in a physical sense. In this case, especially more broadly though, it served to as a great example of how some technology is becoming infrastructure in our lives. I continuously hear various discussions each day that talk about how we must measure the impact of technology on the output of our companies. In many instances, I don’t disagree. But like any other mindset we use to solve problems, the idea of ROI has it’s limits. Some technology will never produce an ROI. Some technology will lend itself well to that existing paradigm and other technologies will not. 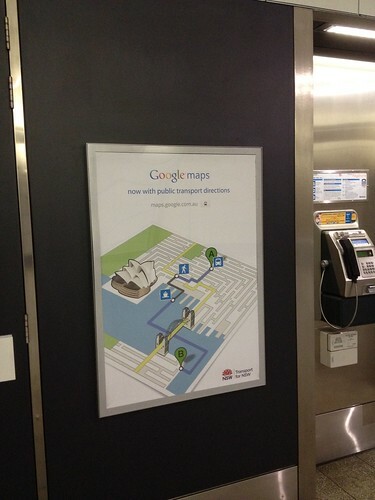 Some technologies, like Google Maps, will serve the role of infrastructure. And like infrastructure, we’ll understand very well the investment required to maintain it but often times have trouble understanding the return we may get.